I get through the sleepless days of being a stay-at-home dad, freelance writer and DIY remodeler with copious quantities of tea. I drink Celestial Seasonings Morning Thunder tea in a big beer stein, which I believe to be quite manly. I also hate to throw out anything I could reuse or recycle. So I scoured the Internet to find 50 uses for used tea bags and tea, other than the primary functions of keeping me hydrated and awake. With thanks to “Reader’s Digest” and “Mental Floss” magazines, the Boulder Dushanbe Tea House, Chinaculture.org and several bloggers and Web forums, here is the definitive list of other uses for tea. We can’t vouch for all these home remedies, as we weren’t able to test all 50 of these items, so let us know how they work. Also tell us if we missed anything. 1. Clean carpets: Clean up musty, dirty carpets by sprinkling dry, used green tea leaves on the carpet. Let them work their magic for about 10 minutes, then vacuum them up. 2. Clean antique rugs: Delicate Persian and Oriental rugs can also benefit from a sprinkling of tea leaves. In this case, sprinkle nearly dry, used whole tea leaves on the rugs, and gently sweep them away. 3. Shine wood floors: The tannins in black tea can help shine and color hardwood flooring. Follow your regular floor cleaning routine by carefully rubbing some brewed tea into the floor (don’t use too much water on hardwood flooring) and letting it air dry. 4. 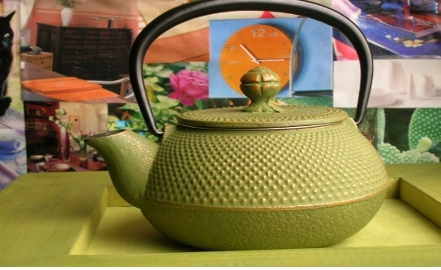 Polish furniture: Brewed tea also can help clean and shine wood furniture. Dip a soft cloth in a small amount of tea, and use it to wipe down the tables, chairs and more. 5. Clean mirrors and windows: Tea can remove stubborn, greasy fingerprints from glass, and make it sparkle. Simply rub a damp teabag on the glass or fill a spray bottle with brewed tea. 6. Clean toilet stains: Rumor has it that used tea bags can magically remove stubborn stains in the bottom of the toilet bowl. Just leave them in the toilet for several hours, then flush the toilet and brush the bowl.